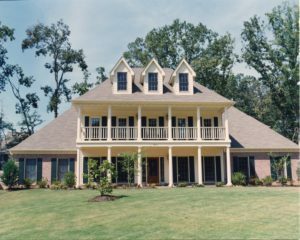 For 30 years now, Magnolia Homes has been well known in the Memphis market as being not only a custom homebuilder but also a personal homebuilder. Reggie and I pride ourselves on a level of customer service and quality of construction that isn’t easily surpassed. We follow a tailored process that provides us with proven success, but more importantly, allows us to provide our customers and realtor partners with the best experience possible when buying or building a new home. I founded Magnolia Homes in March of 1987 as a single mother of two children, Abbey and Reggie. Thirteen years later, in 2000, Reggie joined the company full-time. While I have always focused on being involved with customers during the home building process, the latest design trends, and customer service, Reggie brought with him innovative ideas, such as design flexibility, energy efficiency, and cutting-edge building materials. Together, we have won prestigious awards and recognitions as some of the area’s best homebuilders. Reggie and I have built a brand on the unique way we approach building homes. All the way down to the very foundation, the Magnolia Homes extra touch is evident in the details. We don’t just sit back and let everyone else do all the work, either. We are integrally involved in every aspect of the building process. I hand select all the lighting and colors on non-custom homes, and I always supervise the finishing process personally and inspect each home to find any imperfections—all part of the legendary Karen Garner walkthrough. Over the years, we have developed seven communities in the Memphis area and built homes in 33 neighborhoods with a new community, Magnolia Preserve, slated for Collierville this year. However, our commitment to community goes well beyond the workplace; we embrace the entire City of Memphis as family. Reggie and I are committed to making Memphis and the surrounding area a better place to live by providing ongoing support to the Memphis Grizzlies, Make-A-Wish, Methodist Healthcare Foundation, JDRF, Memphis Child Advocacy, St. Jude Children’s Research Hospital, and Hope Church. Our extraordinarily high standards of construction and customer service have been applied to more than 800 unique homes over the last 30 years. As a representation of that “extra touch”, each home includes a Magnolia tree thoughtfully planted in the yard and an etched magnolia limestone placed in the brick. I am proud to have had the opportunity to serve hundreds of families and would like nothing more than to continue our tradition of quality and service for the next 30 years and beyond.